Do you have ancestry in the Queensland teaching profession? The Education Office Gazette was a monthly publication that covered many items of interest to teachers. It listed teacher movements (admissions, promotions, transfers, and those who left the service), openings and closures of schools, lists of scholarships and bursaries, the Departmental Roll of Honour, examination papers, regulations and a host of other items affecting the conduct of education in the state. 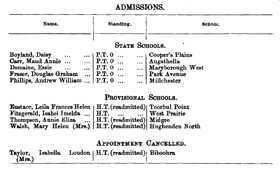 This database indexes the teacher admissions, promotions, transfers and resignations in Queensland during the period 1907 to 1920, listing the name, type of entry, standing, school(s), date and page reference in the relevant Education Office Gazette. It covers entries for student-teachers and pupil-teachers through to head teachers and inspectors, as well as relieving, part-time, and itinerant teachers. It also provides some additional information for "Admissions" (regardless of whether it was a read mission) and "Left the Service" (whether by resignation, death, or having left under some regulation). During this period, the Gazette recorded teachers who had been "wounded", "died of wounds" or "killed in action" in World War I. These lists were repeated monthly giving updates on each teacher, for example, tracing a teacher through it may show "wounded", "wounded twice", "died of wounds". Some teacher scholarship holders are also listed. This is a wonderful genealogy tool for anyone exploring their family history or building a family tree. Search now!